"As I like so much your last design that you have made for me, I would like to publish it too in a Spanish magazine, indicating that is a BTL Design of course." The greatest reward BTL Designs can receive, is that our hard work has been effective in growing the businesses of our clients. However, we have also been recognized within the design industry as a design leader! You can rest assured that when you work with BTL Designs, you are getting a creative partner that will produce world-class marketing ideas and professionally executed designs. We look forward to working with you! The Foundation awarded Barbara Lawrie with a beautiful acrylic desktop award in appreciation for her contribution to the P.R.E. 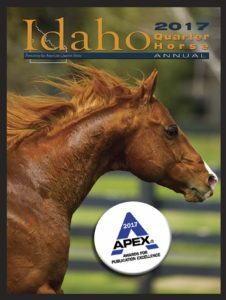 Horse Magazine throughout 2009. A testimony to her dedication and design eye, the letter accompanying the award was truly special including a heartfelt thank you from the Board of Directors. 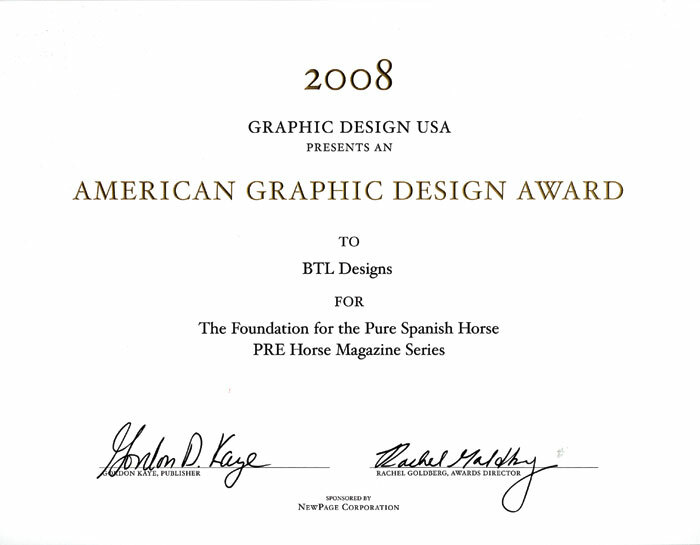 The 2008 American Graphic Design Awards, the biggest and broadest awards contest in the United Sates honored BTL Designs with an “Award of Excellence” for the ‘Foundation for the Pure Spanish Horse” PRE Horse Magazine Series. With over 10,000 submissions, it was a high honor indeed! Awarded by The Wisconsin Badger Awards in Fall 2008, the PRE Horse won the prestigious Badger Award along with Signature Press for overall design and printing excellence. • First Place, Two and Three Color Advertisement Category. Conceived, designed, illustrated and wrote a three-color house advertisement. 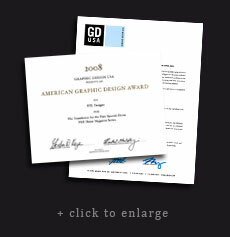 • Second Place, Black and White Editorial Design Category. Conceived, designed and illustrated an editorial layout. • Honorable Mention, Full Color Advertisement Category. Designed a full color Holiday Greetings, full page advertisement. Copyright © 2014-2018 BTL Designs. All Rights Reserved. to see Award and Letter.